BRANDON, Man. – The Brandon University (BU) School of Music’s pro series will shine the spotlight on some old friends on Sunday afternoon: Former Dean of Music Michael Kim returns to the Lorne Watson Recital Hall stage with the Fine Arts Quartet. 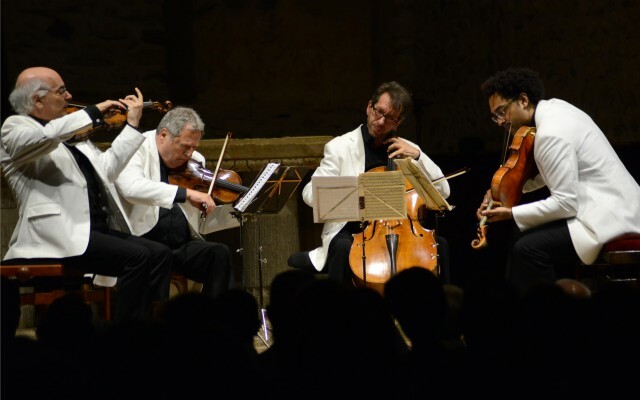 Kim, who is now the Director of the University of Minnesota School of Music, will be back for one performance with violinists Ralph Evans and Efim Boico, violist Juan-Miguel Hernandez and cellist Robert Cohen. The Artists-in-Residence at the University of Wisconsin-Milwaukee, the Fine Arts Quartet has evolved and changed personnel over its seven decades of existence, all the while teaching up-and-coming musicians and entertaining audiences worldwide. This pro series concert will take place on Sunday, at 3 p.m., in the Recital Hall, located in the Queen Elizabeth II Music Building. Tickets will be available at the door or in advance at the School of Music main office. They are $15 for adults, $12 for seniors, students and BU alumni, and $10 for Conservatory students. Opening the program is Beethoven’s String Quartet No. 14, Op. 131. It was composed in 1826 at a time of great change in the composer’s approach to writing. As an important figure straddling the classical and romantic periods, Beethoven proved to be a pivotal agent of change. This late work is an example of this as he helped to pave the way for future transformations of the quartet form by launching seven sections with a fugue. Until then, classical quartets comprised of four movements. The second work is Dvoràk’s Piano Quintet in A Major, Op. 81, which the composer created in 1887 while on a sojourn in Bohemia. One of the prevalent traits in his music is the infusion of folk music elements, and this quintet hints at a “borrowed” ballad and a Bohemian dance. The next pro series presentation will feature Polycoro, a Winnipeg-based choir. That concert will take place on Wednesday, Feb. 3, at 8 p.m., also in the Lorne Watson Recital Hall. Please note that seating in the Lorne Watson Recital Hall is limited and that programs are subject to change. For an up-to-date listing of pro series and student performances, please visit brandonu.ca/music/events/category/performances/.